At plumbers in Dublin boiler repair work is on of the most common jobs we carry out. A good standard rule of thumb for the lifespan of a well looked after boiler would be 12-15 years. Along the way though there will usually be one of more parts that pack up. At this point you are advised to look for a boiler repair specialist. Plumbers in Dublin have been repairing boilers both gas and oil throughout the county for over 30 years now. During this time we have dealt with more or less every type of domestic, commercial or industrial boiler in the market place. As all of our boiler repair specialist are R.G.I. registered there is no need to worry about whether we can work on gas boilers. Firstly we don't operate a call out charge like some companies. Neither do we charge for travel time or time for picking up parts. As we deal with all the major part providers throughout Dublin and have been doing so for many years we always know where to get the best prices. So it doesn't matter if it's a new heat exchange, expansion vessel or P.C.B. board you require, we can get it the cheapest. We will always be delighted to provide a free quote. We are unusually transparent in our pricing without hidden fees or charges. We give a price and stick to it. We are comprehensively insured and all of the work we undertake carries our 1 year plumbers in Dublin parts and labor guarantee. 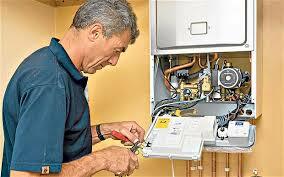 Our emergency boiler repairs team work an on call 24/7 roster. This means if you call us in the morning evening or weekend we can still help you get your heat and hot water functioning again for you.